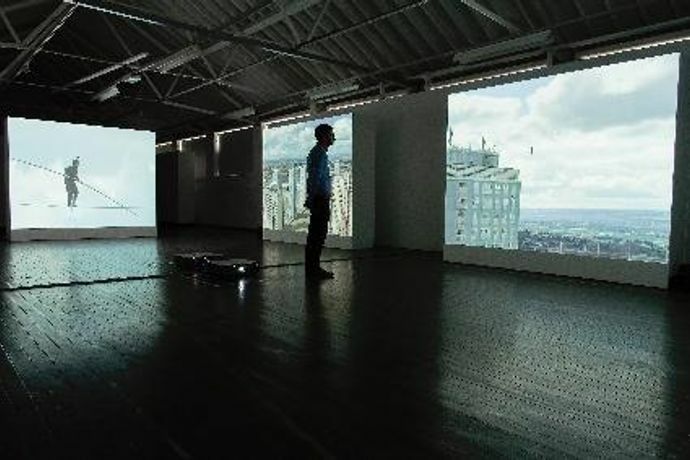 Berwick Visual Arts and Visual Arts in Rural Communities (VARC) present the multi-channel video installation High Wire (2008), by acclaimed British artist Catherine Yass. The work follows the French high-wire artist Dider Pasquette, who was invited by Yass to walk a wire strung between two towers on the Red Road Estate in Glasgow. Stepping out between what were once the highest social housing blocks in all of Europe, Pasquette offers us the ultimate vertiginous perspective. Catherine Yass trained at the Slade School of Art, London; the Hochschüle der Künst, Berlin; and Goldsmiths College, London and was shortlisted for the Turner Prize in 2002. Her work features in a number of major important collections worldwide including Tate, London; Arts Council of England, The British Council and the Government Art Collection and she has exhibited internationally. The exhibition of this work is part of WALK ON, Art Walking Northumberland, a project supported by the Rural Development Programme for England, jointly funded by Defra, the European Union, and from Arts Council England. Substantial support has also been generously given by Art Circuit Touring Exhibitions and W.A.L.K (Walking, Art, Landscape and Knowledge). Go to www.varc.org.uk for full details. High Wire is shown with thanks to and generous support from the artist and Artangel, who commissioned the work with Glasgow International Festival of Contemporary Visual Art in 2007.